The live attenuated influenza virus vaccine (LAIV), Flumist®, administered by intranasal spray, is approved for people aged 2-59 years. The National Advisory Committee on Immunization (NACI) recommended in its statement for the 2011-2012 season that, given its efficacy and immunogenicity, LAIV should be used preferentially for healthy children and adolescents aged 2 to 17 years. NACI also indicates that LAIV can be used for children with chronic diseases, other than immune compromising conditions or severe asthma, but that there were insufficient data to recommend the preferential use of LAIV over trivalent inactivated vaccine (TIV). 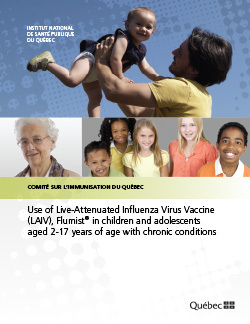 The Comité sur l'immunisation du Québec (CIQ) also recommended, at its June 2011 meeting, that LAIV should be used preferentially in healthy children aged 2-17 years, particularly among household contacts of people at high risk for complicated influenza infection. At the December 2011 CIQ meeting, the question of LAIV preferential use in children and adolescent with chronic conditions was discussed again and, despite the absence of data demonstrating superior efficacy of LAIV in this group, members of the CIQ felt that there was no reason to believe that the immune response would be different from that obtained in healthy children. In order to ensure harmonization of vaccines for use in the paediatric population and to ensure equity, the Ministère de la Santé et des Services sociaux du Québec (MSSS) asked the CIQ to reconsider this issue and justify the merits of LAIV preferential use in children aged 2 to 17 years with chronic diseases without immune compromise.